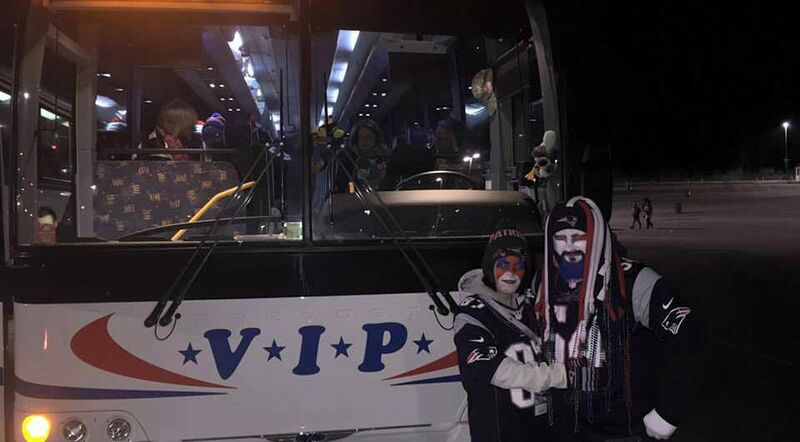 VIP’s Patriots Fan Bus to Gillette Stadium is the only bus departing from Maine for every Patriots home game. Arrive in style to see your favorite NFL team make their way to another Superbowl and achieve ring #6. 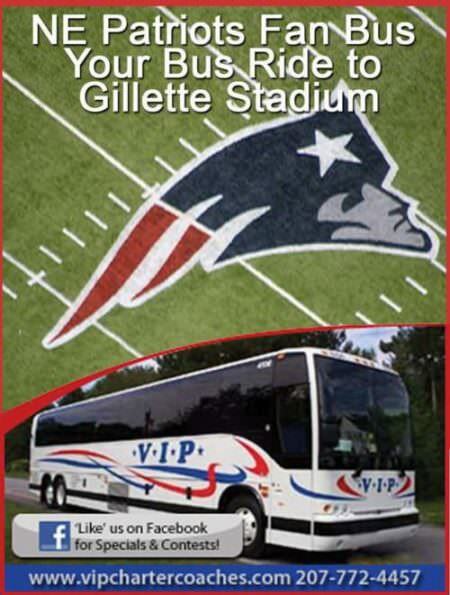 Here’s the scoop: Ride the VIP Patriots Fan Bus deluxe motorcoach to Gillette Stadium for the New England Patriots home games this 2017 season. We know driving, parking and fees are a huge hassle, so leave that up to us! This is a ride only and does not include your game ticket. The price is $55.00 per person. You’ll have time to explore or visit Patriot Place. We arrive approximately 2 hours before the game begins. The bus begins departure 30 minutes after the game ends. The Patriots Fan Bus frequently sells out, so be sure to make your reservations. Arrive to your pick up location at least 15 minutes prior to the scheduled departure times. Your driver will have your name(s) on a paid reservation list. You may bring snacks and drinks with you. This is an all-ages bus and there is no alcohol consumption allowed on board. You are welcomed to leave your belongings on the bus for the day/evening. The bus will be parked in a lot designated by the stadium for the entire game. Please be back to the bus within 30 minutes of the game completion. It is customary practice to provide your driver with gratuity for a job well done. This trip is ride only. Your game ticket is not included.